EDITOR’S NOTE: The below recap originally ran as part of our coverage of the 2017 Film Independent Forum. This year’s Forum takes place April 26-28. Click here to see a complete schedule and register to attend today by clicking here. Day Three of the 2017 Film Independent Forum began with a note of gratitude and accomplishment, as moderator and Film Independent Curator Elvis Mitchell asked keynote honoree Jordan Peele what it felt like to be discussing Get Out, his feature directorial debut, in front of so many people. “This is something I’ve been shooting for my whole life, calling myself a director,” said the 38-year-old filmmaker, who prior to Get Out has best been known for his comedy work. The keynote was supported by Universal Global Talent Development & Inclusion. Peele observed that, “the things I was working towards with this movie [are] racially divisive,” noting that it took a great care and attention to ensure that divisiveness wouldn’t fracture his audience. Peele credited much of the film’s universal appeal to lead Daniel Kaluuya, who plays Get Out’s protagonist. “By the middle of the movie, or even earlier, everyone in the theater is [Kaluuya’s character] Chris,” he said. 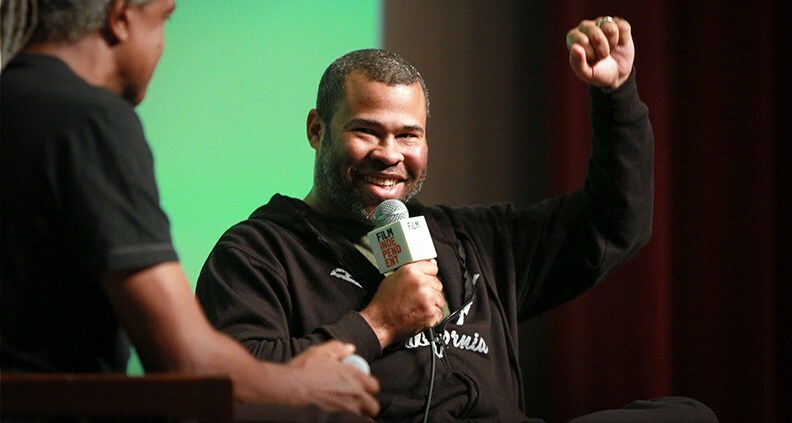 Peele said that he first began to think of Get Out’s story during what he called “the post-racial lie” of the Obama years. Originally, Peele’s idea for the story involved a secret plot to re-enslave black Americans through hypnotizing them. Though the hypnosis angle was retained in part, Peele eventually reshuffled the narrative to be an exploration of white progressive micro-aggressions. The lights dimmed for a clip: Get Out’s arresting opening scene (“How did you get that without credits on it?” Peele wondered.) Afterwards, Mitchell noted that the sequence—a single long take following Lakeith Stanfield’s character’s sudden, brutal abduction while wandering lost in a white suburban neighborhood—felt like a bad dream. Peele agreed. “It needs to be tailor-made as the protagonist’s worst nightmare,” he said. Initially, the scene had been envisioned as a Hitchcock-inspired short film with extensive coverage. But when that vision failed to come together because of ill-timed rain, the sequence was re-calibrated as an economical (though well-choreographed) single take. Mitchell asked about the film’s approach to conjuring scares. It was an emotional response Peele said was not dissimilar to his comedy work. “Any good scary moment is not intellectual for me. It’s a feeling and a vibe.” A big part of creating a believable story, he said, was to engineer situations that wouldn’t immediately send Kaluuya’s Chris packing. The 2019 Film Independent Forum takes place April 26-28 in the heart of Silicon Beach, at the new LMU Playa Vista campus. Click here to learn more. Buy your 2019 Forum pass today by clicking here. Passes are $195 for Film Independent Members and $265 for non-Members. Passes include lunches, receptions, screenings and free parking all weekend. Not yet a Member of Film Independent? Click here to join. The 2019 Film Independent Forum is supported by Premier Sponsors SAGindie, Cast & Crew and University Partner Loyola Marymount University School of Film and Television. Subscribe to our YouTube channel for exclusive interview clips, full panels and other exclusive material from the 2019 Film Independent Forum. Also: be sure to follow Film Independent on Facebook, Twitter and Instagram.